Department of Biological Sciences and Bioengineering, Indian Institute of Technology Kanpur, Kanpur-208016, UP, India. # Present address: Polymer gel cluster research center, Yeungnam University, 214 Dae-dong, Gyeongbuk 712-749 South Korea. * Authors have equal contribution in this paper. Alpha- ketoglutarate (α-KG) is a well-known intermediate of Kreb's cycle and thus one of the important candidates in the role of cellular metabolism. The aim was to investigate the effect of α-KG on the growth and proliferation of different cells (fibroblasts and chondrocytes). Further change in the consumption of glucose and release of ammonia in the media, upon the addition of α-KG was also examined. NIH3T3 and chondrocytes were seeded on two different macroporous cryogel matrices synthesized by poly (hydroxyethylmethaacrylate)-gelatin (HG) and alginate-gelatin (AG). Higher proliferation was observed for both the cell lines in 2-D as well as 3-D where α-KG was added to the media compared to the controls. It was evident that the chondrocytes were metabolically more active in the case of α-KG containing samples as early extracellular matrix (ECM) accumulation was observed. 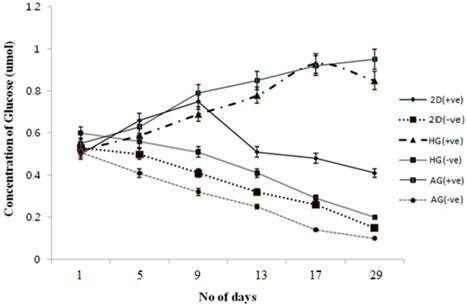 In comparison to the 6-8 weeks duration required by the chondrocytes for ECM accumulation in normal in-vitro culture conditions, α-KG containing samples showed an earlier accumulation within 3 weeks. In order to further validate the results, scanning electron microscopic (SEM) analysis was performed showed high ECM deposition and cells embedded in the matrix. Homogenous distribution of cells on both the synthesized matrix was reported using 4'-6-diamidino-2-phenylindole (DAPI) and propidium iodide (PI) staining. 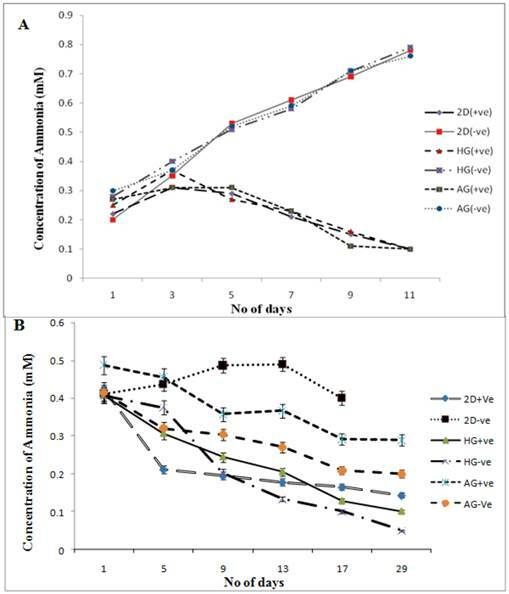 The results clearly showed reduction in ammonia concentration in α-KG containing samples thus leading to decreased ammonia toxicity that builds up during long cell culture conditions thereby enhancing the proliferation and metabolic activity. Thus α-KG can be used potentially for long batch-cultures for the production of vaccines or antibody as well as can play an important role as a bioactive molecule for in vitro neo-cartilage generation. Keywords: alpha-ketoglutarate, alginate-gelatin, ammonia toxicity, chondrocytes, cryogel, fibroblasts, poly (hydroxyethyl methacrylate)-gelatin. One approach in tissue engineering is to use exogenous growth factors and utilize its effect on cell-matrix interactions. There are various growth factors that have been used in enhancing the cell growth and thus decreasing time of neo-tissue formation. For example, bone morphogenetic protein II (BMP II) has shown to enhance the cartilage formation and helps in accelerating cell proliferation. On the other hand the advancement in the field of biotechnology has opened up arena for bio-artificial synthesis of therapeutics which includes hormones, vaccines, antibodies and various immuno-adjuvants . One of the most important components for production of these biological products is primary or immortal cells. The cells cultured in laboratory conditions has specific requirements in which the cell media plays an important role  but frequent accumulation of toxic catabolic components like ammonia effects the overall cellular growth which directly effects the therapeutic production . There has been constant focus in exploring molecules that show positive effect on overall cellular growth, metabolism and can also help in removing the toxic catabolites. One of such molecules is α-KG, which is a known Kreb's cycle intermediate and plays a critical role in the cellular energy metabolism . MacKenzie and group  indicated α-KG as a component for new possible therapy in treating cancers associated with tricarboxylic acid (TCA) cycle dysfunction. Fumarate hydratase (FH) and succinate dehydrogenase (SDH) which are important components of TCA cycle and act as tumor suppressors and loss of either of these components activates a major tumor-supporting event as there is pseudohypoxia condition created in the cells. This event in-turn activates hypoxia-inducible factor (HIF) as HIF-α which is stabilized by FH and SDH and excess or defiant TCA cycle components inhibit HIF-α prolyl hydroxylase (PHD). Introduction of cell-permeating α-KG derivatives showed restoration in PHD activity and level of HIF-α to SDH-suppressed cells. α-KG is recognized as a scavenger for ammonia in hepatocyte culture  as it serves as a precursor for non-essential amino acid like glutamate and glutamine [7, 8]. Glutamine is found to inhibit degradation of proteins in the muscles and along with transaminated α-KG forms excitatory neurotransmitter glutamate . It is also found to penetrate into the bone tissue and helps in its metabolic regulations . Shuprisha et al. showed real-time assessment of effect of α-KG on organic anion secretion in proximal tubules of perfused rabbit and illustrated that in presence of α-KG, the luminal and basolateral sodium ion dicarboxylate (Na+-DC) co-factors could support significantly the net fluorescein (FL) secretion. It is also reported in few studies that α-KG is involved in collagen metabolism by increasing the activities of prolidase, a known key factor in collagen metabolism . Collagen being important connective tissue in the body which contributes largely towards the structural integrity of the tissues, thereby suggesting that α-KG can be used for controlling the metabolism of the collagen. Effect of α-KG on collagen can make it an important molecule in various therapeutic and cosmetic applications. Other reported beneficial activity of α-KG includes prevention against ischemic injury in heart surgeries  and prevention of protein depletion after trauma or surgery . Apart from the media and various growth factors, microenvironment plays an imperative role in cell culture. Major difference in cell behaviour in the culture system and their counter parts in vivo system is the dissociation of cells from three-dimensional (3-D) geometry and their propagation on the two-dimensional (2-D) substrate. The specific cell interaction characteristic of the histology of tissue is lost as cells spread out and starts to proliferate leading to de-differentiation of cells . Culture environment also seems to lack the systemic components that are involved in the homeostatic regulation in the in vivo, as a result cellular metabolism can be more constant in the in-vivo than in-vitro conditions . There are intrinsic factors that need to be added to obtain the cell functions that resemble the in vivo tissue regeneration more closely . Cells have shown to proliferate better in the 3-D environment due to greater available surface area and better transport of nutrients. Progression in the field of tissue engineering has led to development of various scaffolds that are tailor made depending upon their applications. In our laboratory, scaffolds using natural and synthetic polymers are designed by special approach known as 'cryogelation' [16, 17] in which matrices are synthesized at temperature that is normally below the freezing temperature of the solvents. The ice crystals formed during synthesis melt in thawing procedure leaving behind a porous structure known as cryogels. The average pore size of these matrix lies between 50-200 µm  and the high porosity of the cryogel due to large interconnected pores ensures convective flow of nutrients and mass transport of gases which is unhindered even in long-batch cultures. These cryogels have been successfully used in cartilage tissue engineering , cardiac tissue engineering , monoclonal antibody productions , bioreactors  and cell separations . In this study the effect of α-KG on fibroblasts and chondrocytes on two different cryogel matrices such as poly (hydroxyethyl methacrylate)-gelatin (HG) and alginate-gelatin (AG) was studied in order to investigate the effect of α-KG on cellular proliferation in the 3-D scaffold. We have also investigated how the ammonia accumulation and glucose consumption differ in diverse cells in the presence and absence of α-KG. This work was aimed to provide an insight to the role of α-KG as a bioactive molecule in the cell culture and tissue engineering applications. Materials: 2-Hydroxyethyl methacrylate (HEMA) (MW: 141.09), sodium salt of alginic acid (from brown algae), gelatin (from cold water fish skin; MW: ~60,000), poly(ethylene glycol) diacrylate (PEGDA), Dulbecco's modified Eagle's medium (DMEM), 3-(4,5-dimethylthiazol-2-yl)-2,5-diphenyl tetrazolium bromide (MTT, 98%) reagent, 4'-6-diamidino-2-phenylindole (DAPI), propidium iodide (PI) and nystatin were all purchased from Sigma Chemical Co (St. Louis, MO, USA). α-KG was supplied by Protista Biotechnology (Lund, Sweden) as a gift. Glutaraldehyde was purchased from s.d. fine-chemicals limited (Mumbai, India). Fetal bovine serum (FBS) and streptomycin-penicillin antibiotic solutions were bought from HyClone (Utah, USA). Ammonium persulphate (APS) was supplied by Merck Chemical Co. (Mumbai, India) and N,N,N′,N′-tetraethylmethylene diamine (TEMED) was purchased from Sisco Research Laboratory (Mumbai, India). All other chemicals used were of analytical grade. Gelatin solution (10 ml; 4% w/v) was prepared in degassed water. To this solution hydroxyethylmethacrylate (HEMA) (0.6 ml) with the final concentration of 6% (v/v) was added and allowed to cool on ice for a brief period of time. Ammonium persulphate (APS) (0.1 ml of 10% w/v) and TEMED (0.01ml) were added as initiators along with poly(ethylene glycol) diacrylate (PEGDA) (ratio 1:2) and glutaraldehyde (25% v/v) (ratio 1:20) as cross linkers. The concentration of cross linkers directly depends upon the concentration of polymers. Polymerization reaction was allowed to proceed overnight at -12 °C in liquid cryostat (lauda RP1840, Germany). The polymerized gels were washed in de-ionized water at room temperature to remove unpolymerized monomers and were vacuum-dried using a lyophilizer after complete thawing. The dried gels were stored at room temperature until further use. Alginate (1% w/v) and gelatin (3% w/v) solution was prepared in de-ionized water and were mixed together properly. To this solution 0.2% glutaraldehyde was added as a crosslinker. The solution was mixed by vortexing and immediately poured in the mould to be kept in the cryostat at -12 o C for 12-16 h. The samples were then thawed in de-ionized water for 15-20 min and dried using lyophilizer for further use. Morphology of AG and HG cryogel samples was studied using scanning electron microscopy (SEM, FEI Quanta 200). Scaffolds were dried overnight before gold coating which was performed using a sputter coater. The microscope was operated under high vacuum at 10-20 kV with sample spot size of 4.5 mm to image the samples. The pore range, pore diameter and interconnectivity of both types of cryogel were determined using scanning electron micrographs associated image analysis software. Scaffolds were sterilized using ethanol in stepwise gradient concentration (20% -100%) and equilibrated with PBS (0.01M, pH 7.0) and media. The media was discarded before setting the experiment. To set up the experiment NIH3T3 cells with the cell seeding density of 0. 2 × 105 cells/well Dulbecco's modified eagle's medium (DMEM) volume of 1ml was seeded on AG and HG cryogel scaffolds of 2 mm thickness. One set of the experiment was performed with 2 mM α-KG containing media (+ve) and another without α-KG in the medium (-ve). Similar protocol was followed for 2-D culture (tissue culture 24 well plate). Experiment was set up for 11 days without changing the medium. For each time point samples in triplicates were set up and the spent medium (500µl) was collected at regular time intervals for glucose and ammonia estimation. MTT assay for cell proliferation was performed on same wells. All the experiments were performed in triplicates. Articular cartilage from the fresh knee joint of Indian Capra hircus (body weight, 4-6 kg, age, 3-6 months) was used to isolate primary chondrocytes. The fresh knee joint was obtained from the local butcher shop and cartilage was removed from it under aseptic laboratory conditions. Cartilage was minced and subjected to enzymatic digestion with 0.3% collagenase type II (prepared in serum free DMEM) at 37 °C for 6 h. The digested cartilage suspension was centrifuged at 150 g for 5 min. The pellet obtained was then treated with 0.25 % trypsin for 5 min to isolate single cells without clumps or undigested tissue. Trypsin was neutralised by adding 10 % fetal bovine serum (FBS) and the suspension of cells was further centrifuged at 300 g for 10 min. Cell pellet obtained were first checked for viability by trypan blue vital dye and then cell number was estimated using a haemocytometer. After isolation, cells were cultured to further proliferate and used after first passage. Cell seeding density was same as NIH3T3 and the experiment was set up for 30 days due to slow proliferation of chondrocytes. Cryogels and 2-D culture of NIH3T3 and chondrocytes at regular interval were tested for cellular growth and proliferation using 3-(4,5-dimethylthiazol-2-yl)-2,5-diphenyl tetrazolium bromide (MTT). MTT assay is spectrophotometeric analysis which quantifies the end product resulting from oxidation of MTT solution by mitochondria of the cells. MTT is regarded as an indirect assay for checking cell growth and proliferation. To describe briefly, the culture medium was collected out from test wells for other biochemical analysis and wells were washed gently with PBS (0.01 M, pH 7.4). MTT solution (0.5%) containing thiazoyl blue was prepared using serum free DMEM and incubated at 37 oC for 4 h. The MTT solution was removed carefully and dimethyl sulphoxide (DMSO) was added at a ratio of 3:1 (DMSO to MTT) in each test well to dissolve intracellular formazan crystals and incubated again for 10 min. The blue-violet colour end product was measured by spectrophotometer absorbance at 570 nm. Ammonia free water was used in the preparation of reagents and washing of glasswares for ammonia estimation. Solution I was prepared by dissolving 1 g phenol and 5 mg of sodium nitroprusside in 100 ml of degassed water. Solution II was prepared by weighing 250 mg of sodium hydroxide along with 2.158 g of disodium hydrogen-orthophosphate and 10 ml of sodium hypochlorite and the total volume was made upto 50 ml. All the above components were mixed well and tightly capped until further used. The test sample i.e., medium from 3-D and 2-D (+ve* & -ve#) (500 µl) was taken and to this 10% sodium tungstate and 1 N sulphuric acid was added to denature protein. The mixture of solution was centrifuged at 1800 g for 15 min. The supernatant was immediately and carefully collected and mixed with 2.5 ml of solution I and solution II . After thorough mixing, tubes were incubated at 37 o C for 35 min. The absorbance was recorded at 625 nm and same protocol was followed for ammonia as standard. All the experiments were done in triplicates. Dinitrosalicylic acid (DNS) (10 g) along with 500 mg of sodium sulphite and 10 g of sodium hydroxide were mixed in 1000 ml of water. DNS (500 µl) and 500 µl of test sample solution i.e., 3-D and 2-D (+ve* & -ve#) were added and the tubes were kept at 90 o C for 15 min to develop red-brown colour complex. The coloured complex developed in the tubes was stabilized using 40 % sodium potassium tartrate (Rochelle salt). The samples were allowed to cool to room temperature and the absorbance was recorded at 575 nm using a spectrophotometer. All the experiments were done in triplicates. Cryogel scaffolds seeded with chondrocytes were fixed with 2.5 % glutaraldehyde after completely removing the media. Air dried samples were sectioned for SEM analysis and DAPI staining. The SEM of the cryogel scaffolds was performed using same protocol as in case of microstructure analysis of scaffolds. DAPI is known for its affinity to bind with AT rich region of double stranded DNA and is used in regular basis for checking the distribution of cells on scaffolds. The fluorescence emitted upon binding with DNA is observed at excitation wavelength of 350 nm (Nikon, TE-2000 U). Propidium iodide which is an intercalating dye binds to double stranded nucleic acid by inserting itself between the strands of the DNA or RNA. So any change in the DNA which results in the change in the nucleic acids structure (i.e. increased histone content and nucleosome formation) will reduce the "stainability" of the DNA. The sections of HG and AG scaffolds seeded with NIH3T3 cells were fixed in 2.5 % glutaraldehyde solution for 2 h. After the cell fixation, cells were permeabilized by the buffer (0.1% TritonX-100) for 30 min and then observed under a fluorescence microscope. The important aspect behind tissue engineering involves culturing of the relevant cells in-vitro into the desired three-dimensional tissue or organ. The 3-D environment provided by the scaffolds to the cells determines the ultimate outcome in tissue engineering applications. The ideal scaffold is expected to be porous matrix with interconnected pores for providing favoured tissue integration and vascularization and should be easily modified or synthesised in different size and shapes. Synthesis of HG and AG scaffolds was carried out under same cryogelation conditions. Both scaffolds retained shapes upon drying at room temperature and showed high water uptake capacity (figure 1 inset digital image). Microstructure analysis by SEM revealed the average pore sizes of HG and AG scaffolds to be 50 µm and 66 µm, respectively (figure 1). Unhindered flow system is again one of the important requirements for tissue engineered constructs as it allows convective flow of nutrients and cell waste during the cell culture and facilitates easy exchange of gases. The average flow rate for both cryogels was found to be 4-6 ml/min under approximate hydrostatic pressure of 0.01mPa through 2.5 ml cryogel monoliths column suggesting that the pores of the cryogel matrix were interconnected and did not show any resistance against the solvent. The reason of choosing two different matrix was to determine the effect of α-KG on cells in combination with the 3-D structure or completely independent of the microenvironment provided for cellular growth. Therefore, HG cryogel matrix was chosen due to synthetic polymer component whereas AG was fabricated with natural polymeric materials. SEM was performed in order to validate the high rate of growth and proliferation observed in MTT assay for the cells seeded on α-KG containing cryogels. Scaffolds allowed uniform and highly dense growth of the cells on α-KG supplied matrices. In addition ECM was observed on these samples within 3 weeks of culture period (figure 2A inset digital image). These results were further confirmed by SEM analysis (figure 2) indicating that the cells were embedded within the secreted ECM. However, the cells on the matrices without α-KG grew uniformly but ECM secretion was not observed in 3 weeks (figure 2B inset digital image) as it was already reported that in-vitro accumulation of ECM in chondrocytes takes around 6 weeks . The fast ECM secretion is beneficial for cartilage tissue engineering applications. In addition the ECM was observed more in AG scaffold than in HG scaffold which might be because it allowed better cell adhesion, proliferation and growth due to the higher average pore size and different material properties like pore size, structure, surface chemistry of the AG scaffold. Moreover AG scaffolds consisted of natural polymers like alginate compared to HG scaffolds which consists of synthetic polymer, HEMA is already shown to inhibit cell adhesion on its surface because of its hydrophilic nature . Scanning electron microscopic (SEM) images of alginate-gelatin (AG) cryogel (A) and poly (hydroxyethyl methacrylate)-gelatin (HG) (B) showing the pore distribution and interconnected pores (inset digital image of respective water saturated scaffolds). Scanning electron micrograph images of alginate-gelatin (AG) cryogel scaffolds showed visible extra cellular matrix (ECM) deposition during chondrocyte culture. Image A shows cells embedded within the ECM secreted by chondrocytes over the period of 30 days on the AG scaffolds with α-KG (inset digital image of ECM deposition). Image B (control) AG cryogel scaffolds without α-KG (inset digital image of the control). Fluorescent imaging of chondrocytes and NIH3T3 on synthesized cryogel matrices. 4'-6-Diamidino-2-phenylindole (DAPI) image of proliferating chondrocytes on (A) poly(hydroxyethyl methacrylate)-gelatin (HG) and propidium iodide (PI) staining on alginate-gelatin (AG) cryogel (B). Similarly DAPI staining of NIH3T3 fibroblast is shown on both the cryogel matrix of poly(hydroxyethyl methacrylate)-gelatin (HG) (C) and alginate-gelatin (AG) (D). DAPI and PI staining were performed as these fluorescent dyes are known for the binding affinity to nucleic acid. DAPI stains nuclei specifically with minimal or no cytoplasm staining and it is known that binding of DAPI with dsDNA produces ~ 20 fold fluorescent enhancement and this enhancement results from the water molecules that is being displaced from the DAPI and minor groove of DNA due to the apparent binding effect . PI was performed as the slight difference in G0/G1 peak of rapidly dividing cells as opposed by slow dividing cells can be easily distinguished using PI staining. DAPI (figure 3A,B) and PI staining of the cells cultured on α-KG containing samples (figure 3C,D) clearly showed uniform and large number of cells growing throughout the AG and HG scaffolds which is in correlation with the SEM results. The cell proliferation was studied using the MTT assay for both the cell lines seeded on two different kinds of scaffolds. NIH3T3 cells and chondrocytes were used in our work as previous reports have shown that addition of α-KG inhibit the catabolism of collagen in dermal fibroblasts as well as enhances collagen content via proline synthesis . This could be used as an advantage for culturing chondrocytes as collagen is one of the most important ECM components of cartilage. The samples for MTT assay were collected every alternate day for NIH3T3 cells up to 11 days, whereas on every 5th day up to 30 days for chondrocytes. The optical density of these samples was compared with the control. 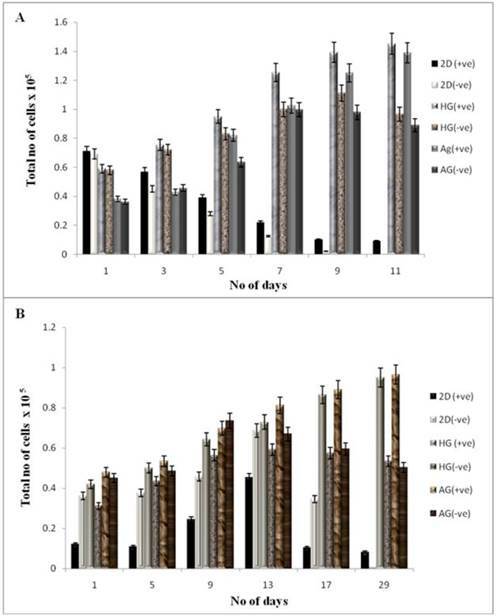 The cells seeded on α-KG containing media showed a higher rate of proliferation compared to the cells seeded on both in 2-D and 3-D culture in the medium without α-KG. Cells seeded on 2-D (tissue culture 24 well plate) reached confluency faster than the 3-D culture due to the availability of lesser surface area (in 2-D) for attachment and proliferation as shown in figure 4 (A, B). Fibroblasts achieved a higher cell density within 24 h as compared to chondrocytes because of their faster doubling time and thus attained confluency within 11 days (figure 4A), whereas 21 days were required for chondrocytes to reach confluency (figure 4B) in the 24 well plate. 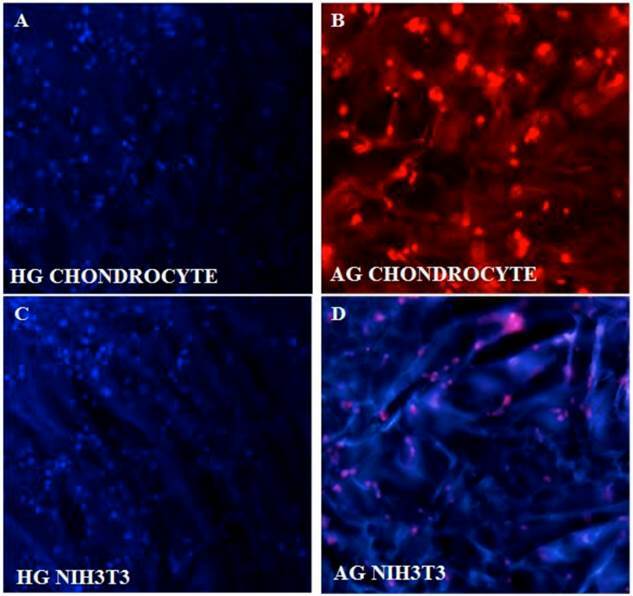 An increment in the cell proliferation was observed in both the cell lines containing α-KG in the medium compared to the control (α-KG negative) as the cell number for both NIH 3T3 and chondrocytes almost doubled in the samples containing α-KG. Comparatively cells seeded on AG scaffold showed slightly higher rate of proliferation compared to HG due to the increased average pore size of AG and also probably because of the favourable material properties which allowed better cell adherence and mass transport of nutrients. So counteracting this slight increase in proliferation on AG scaffold, based on the similar results in 2-D, the increment in cell number can be attributed to the added α-KG in the media. α-KG is an intermediate in the Kreb's cycle and serves as a source of energy for the cells. Around 50 % of the added α-KG is converted to energy whereas the rest of it is involved in the anabolic effects like synthesis of amino acids . Moreover α-KG was reported to act through G protein-coupled receptors, which are very well known for signalling of the cells . Thus its addition might increase the cell's metabolism and signalling which in turn brings about enhanced cell proliferation. Moreover α-KG acts as a scavenger for the ammonia released by the cells in the medium during the culture period. This can minimize the exposure of the cells to the accumulated toxic ammonia and thus allows them to continue to proliferate for a longer period of time . Cell proliferation of NIH3T3 and chondrocytes in 2-D and 3-D culture conditions. HG is poly (hydroxyethyl methacrylate)-gelatin cryogel and AG is alginate-gelatin cryogel. (+ve) indicates experiment with α-KG and (-ve) indicates experiment without α-KG. (A) The cellular proliferation of NIH3T3 was measured by (3-(4, 5-Dimethylthiazol-2-yl)-2, 5-diphenyltetrazolium bromide (MTT) assay. The NIH3T3 cells were seeded on two different cryogel scaffolds HG and AG in 3-D along with the 2-D culture. The experiment was divided in two sets; one containing α-KG and the other without α-KG which were analyzed in regular time intervals. The diagram indicates cell proliferation for the samples containing α-KG compared to samples without α-KG. (B) Similar experiment was performed for primary chondrocytes. The graph indicates proliferation of chondrocyte in 3-D and 2-D in presence of α-KG as compared to the cells cultured without α-KG. All the experiments were performed in triplicates. The synthesized glutamine is a known metabolic fuel for the cells and also a precursor for the synthesis of glutamate, a known neurotransmitter. We observed here that α-KG helps in the enrichment of the medium and at the same time causes reduction of the build-up toxicity leading to enhanced proliferation and survival of the cells over the period of time. Glucose is one of the main sources of energy for the cells to carry out various metabolic activities. So in order to check the effect of α-KG on cells and their proliferation, glucose measurement using DNS method was performed. The standard graph was used to determine the concentration of the glucose in the test samples as well as the control. Compared to the control as shown in figure 6 the glucose consumption decreased for the α-KG containing samples. It is known that α-KG undergoes transamination to amino acids like glutamate and glutamine wherein glutamate is a known neurotransmitter and glutamine, a precursor for glutamate, can also serve as an alternate source of energy for the cells when present with sugars like glucose. Glutamine undergoes aerobic oxidation from TCA cycle resulting in cell energy. Thus the samples containing α-KG resulted in less glucose consumption compared to the control . Similar results were observed for glucose consumption in α-KG containing 2-D cultures. In conclusion our finding observes the positive effect of α-KG on different cells in 3-D culture. In this study it was clear that enhanced cell proliferation could be achieved by adding α-KG in the culture medium. In our previous study improved production of monoclonal antibody was achieved by the addition of α-KG in medium . Macroporous cryogel matrix helped in the better nutrient transport and cell growth and addition of α-KG prevented the accumulation of the toxic catabolites resulting in improved culture stability. In chondrocyte culture in 3-D environment, the ECM secretion was fast and started accumulation of the matrix within three weeks of the culture time which was well ahead than normal in vitro ECM production. Thus this provides the understanding that α-KG can be used as a key ingredient in enhancing the cell growth and proliferation in general and for cartilage tissue engineering in particular. The effect of α-KG on both types of cells was positive however was not independent of the matrix and microenvironment. Cells cultured on AG showed better proliferation in comparison to HG and similar trend was noted even with ammonia and glucose. There is inter-dependency between the factors and scaffold and interplay between these moieties results in enhanced cell proliferation and increased ECM production. The α-KG can be used potentially as growth factor especially in the field of cartilage tissue engineering. Chondrocytes are slow growing cells as a result of which ammonia toxicity builds up more often leading to slower formation of neo-cartilage hence various approaches are needed to overcome this limitation. We have shown the use of α-KG at certain concentration could overcome this bottleneck in cartilage tissue engineering for enhanced cell growth and proliferation and for negating the toxic effect of ammonia to obtain faster secretion of matrix component leading to the early formation of neo-cartilage can be a cost-effective substitute as a bioactive molecule. Ammonia measurements in NIH3T3 and chondrocyte cultures in 2-D and 3-D conditions. HG is poly (hydroxyethyl methacrylate)-gelatin cryogel and AG is alginate-gelatin cryogel. (+ve) indicates experiment with α-KG and (-ve) indicates experiment without α-KG. Effect of α-KG on ammonia accumulation in NIH3T3 cells and chondrocytes derived by standard graph (0, 0.5, 1.0 mM concentration) was plotted to derive the R2 value, which was further used in determining the ammonia concentration in test samples. (A) The ammonia accumulation in NIH3T3 cultured in presence of α-KG in 3-D (HG, AG) and 2-D conditions in comparsion to expereiment set-up without α-KG (-ve). (B) Figure shows the concentration of the ammonia accumulated in the media when chondrocytes were cultured in the presence and absence of α-KG for a period of 29 days. All the experiments were performed in triplicates. Glucose metabolism during chondrocyte culture in 2-D and 3-D culture conditions in the presence and absence of α-KG. HG is poly (hydroxyethyl methacrylate)-gelatin cryogel and AG is alginate-gelatin cryogel. (+ve) indicates experiment with α-KG and (-ve) indicates experiment without α-KG. Effect of α-KG on the chondrocyte was checked over a period of 3 weeks in two different cryogel scaffolds. Standard graph was obtained by plotting the known concentration of glucose against the absorbance which was further used to determine the glucose concentration in the test samples. All the experiments were performed in triplicates. Authors would like to acknowledge the financial support by Department of Biotechnology (DBT), Govt of India and Department of Science and Technology (DST), New Delhi- through its Unit of Excellence on Soft Nanofabrication at IIT Kanpur. TV would like to acknowledge Council of Scientific and Industrial Research for Sr. Research Fellowship. Alpha- ketoglutarate: α-KG; poly (hydroxyethylmethaacrylate)-gelatin: HG; Alginate-gelatin: AG; Extracellular matrix: ECM; Scanning electron microscopic: SEM; (3-(4,5-Dimethylthiazol-2-yl)-2,5-diphenyltetrazolium bromide: MTT; 4'-6-diamidino-2-phenylindo le: DAPI; Propidium iodide: PI. Corresponding author: Department of Biological Sciences and Bioengineering, Indian Institute of Technology Kanpur, Kanpur-208016, UP, India. Tel. : +91-512-2594051 Fax: +91-512-2594010 Email: ashokkumac.in.